I would like to create more animation using Pro motion NG however one thing that is very frustrating is the layers are all linked together for animation. At the moment if you move a frame on a certain layer all layers are effected and not just the current layer. Not sure how difficult it is to implement but here is a rough concept of what would be very useful and powerful for animators. The idea being to give animators the ability to reorder frames on the current layer only and see/reference master key frames across multiple layers. Love to hear other peoples ideas and suggestions. Anything to improve this feature would be very much appreciated as I don’t doubt it involves a lot of work. I plan to add an additional, more extended timeline that takes care of this. At the moment I could simplify it using your suggestion: adding a modifier key that only drags the current layer. I added both request to my list. But… you can achieve this with AnimBrushes right now. Hit “A” to select the number of frames to be cut/picked up as AnimBrush. Hold Alt when picking up the brush (LMB: pick up, RMB: cut). Go to the frame where you want to place it. Hold + LMB. 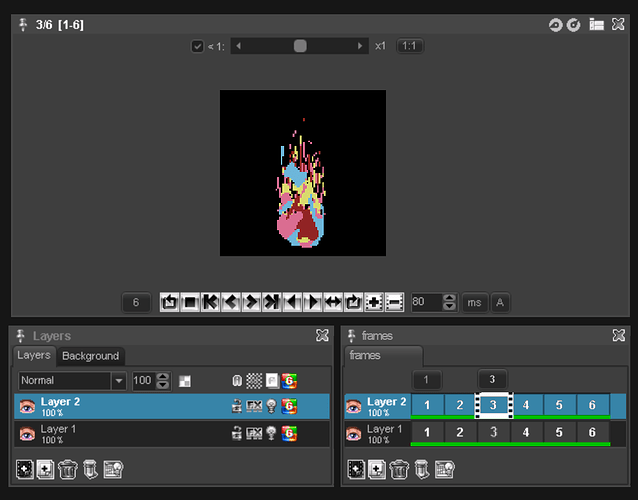 You can also navigate through the AnimBrush frames (see Menu Brush/AnimBrush). This gives a lot of flexibility but I understand that for certain simple operations like shifting frame it makes sense to add shortcuts. That sounds great. I’m really looking forward to this feature. The AnimBrush is the current method I’m using. However the main issue is that it is very manually intensive and it is very easy to misalign frames as you have to manual place them back down. I was looking forward to this innovation in 7.2.0 !!! When do you plan to add such navigation for animation? I have to use another software for animation, but I really want to use Pro Motion! I hope this will happen soon.